A traditional Jazz Band for hire in Portchester Hampshire UK. Their striped blazers and straw boaters twenties look makes them one of Portchester's smartest jazz bands. This Jazz Quartet consists of trumpet, clarinet, banjo and, sousaphone (tuba). This acoustic jazz band in	Portchester does not need electricity so they are mobile and can provide entertainment anywhere . 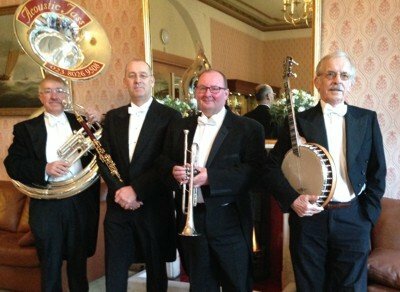 When you hire this traditional jazz band in Portchester like most jazz bands they play a mixture of the classic jazz standards, blues, and popular songs of the early 20th century, live musical entertainment that appeals to all ages. The Jazz Band giving a Concert at St Mary's Church.